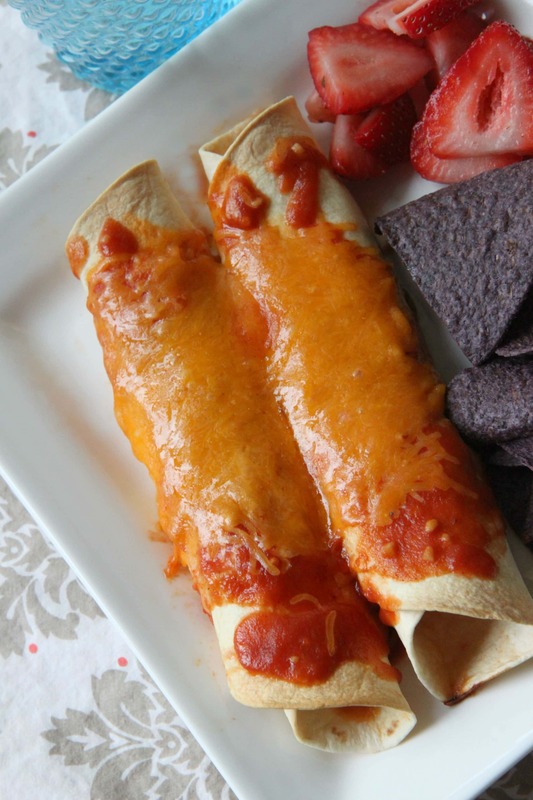 My family is not really into Mexican food and I have to ease them into new dishes, thus why the enchiladas are not smothered in sauce and cheese. Instead, I provided the sauce and cheese on the side so everyone could smother them (or not smother them as they like). 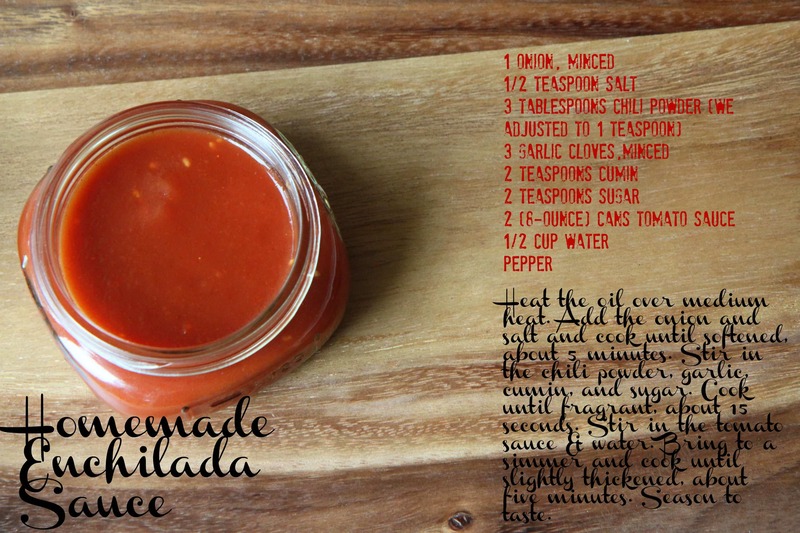 I really loved this homemade enchilada sauce because it was made from pantry ingredients. I also could adjust the spiciness to our own tastes (hold the cumin, 1 teaspoon of chili powder versus 3 tablespoons). That is truly the beauty in making your own mixes & convenience foods. The entire family gobbled these up and the enchilada sauce on the side appealed to my children’s urge to dip everything. These were absolutely delicious and we had just enough leftover to take in my husband’s lunch this week. Adjust an oven rack to the middle position and heat the oven to four hundred degrees. Combine the chicken, 2 cups of the cheddar cheese, 1/2 cup of the enchilada sauce, the chiles and cilantro. Season with salt & pepper to taste. Stack the tortillas on a microwave-safe plate, cover with plastic wrap and microwave on high until warm & pliable (approximately 1 minute). Spread the warm tortillas out over a clean counter. Place 1/3 cup of the chicken mixture evenly down the center of each tortilla. Tightly roll the tortilla around the filling, then lay seam-side down in a 9×13” baking dish lightly coated with vegetable oil spray. Lightly spray the enchiladas with vegetable oil spray. Pour 1 cup of the remaining sauce over the enchiladas to coat thoroughly. Sprinkle the remaining 1 cup cheddar down the center of the enchiladas. Cover the baking dish with foil and bake until the enchiladas are heated through, 20-25 minutes. Remove the foil and continue to bake until the cheddar browns, about five minutes longer. Serve, passing the remaining 1 cup of sauce. Heat the oil in a 12″ skillet over medium heat until shimmering. add the onion and salt and cook until softened, about five minutes. Stir in the chili powder, garlic, cumin, and sugar. Cook until fragrant, about fifteen seconds. Stir in the tomato sauce and water. Bring to a simmer and cook until slightly thickened, about five minutes. Season with salt & pepper to taste.